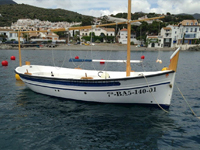 A SPANISH PNB (PATRÓN DE NAVEGACIÓN BÁSICA) LICENSE OR ITS EQUIVALENT IN YOUR HOME COUNTRY OR AN INTERNATIONAL CERTIFICATE OF COMPETENCE OR BOAT LICENSE IS REQUIRED. 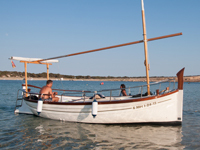 If you do not have a boat license you can hire the skipper: € 120 per day, from 12,00 t0 20,00 hour. If you have a proper certification but you do not have much experience, we will be happy to explain everything you may need for a safe navigation. Additionally, our boats are equipped with GPS tracking systems that allows us to locate you at all times in the event you may require our assistance. We also offer the possibility to take you to an agreed location and leave you anchored there until the agreed pick up time on the next day. 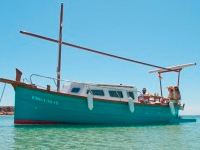 Our llaüts decks are very roomy and cozy and during the day 6 people can be comfortably accommodated on board. However the smaller size of the cabin only allows for 2 double beds, making it ideal for 4 people at night. Therefore when booking for a group of 6 people, we offer the possibility of using the deck mattress to sleep on the outside, providing you with two sleeping bags and extra cushions free of charge. Obviously you should consider the inconvenience of sleeping outside, in addition to the possibility of adverse weather. We also offer you the possibility to rent for the day only (no overnight stay). Pick up at 12:00 h and return at 20:00 h. The rate doesn’t change. With skipper: from 12:00 to 20:00 h.
SABARCA DE FORMENTERA REQUIRES A BOOKING DEPOSIT OF 50% OF THE TOTAL RENTAL COST AT THE TIME OF BOOKING. THE REST WILL BE PAID BEFORE BOARDING THE LLAUT. Payment can be made by credit card. For other payment options please contact us (info@sabarcadeformentera.com). If you want to cancel your reservation send an email as soon as possible info@sabarcadeformentera.com. – Notification made less than two weeks prior to departure: the initial deposit of 50% is non refundable. – Between 1 month and 2 weeks prior to departure: Half of the initial deposit will be returned. – With more than 1 month: the initial deposit is fully returned. – Between 1 month and 6 weeks: Half of the anticipated money will be returned. – With more than 6 weeks. : The deposit is returned. -The time limit for returning the boat must be respected, proportional part will be charged plus 30€ to compensate Sabarca de Formentera. If the delay is greater than 2 hours and it causes the next customer to cancel its reservation, an additional penalty will be charged equivalent to one extra day of rental. Sabarcadeformentera may at its discretion cancel the booking, on that case rental cost will be refunded. (Realising the customer satisfied and renouncing any other compensation). In case of delay in delivery by sabarcadeformentera, the proportionate share will be deducted. Overcome two hours the customer may cancel the contract. 1-You sleep inside the port and only pay half price. 2-You can postpone the activity in another available day. 2-We return you the booking amount. RATES ARE FOR A BOAT RENTAL FOR ONE DAY+NIGHT (from 12:00 to 11:00 h. of the next day) . We also offer you the possibility to rent for the day only (no overnight stay). Llaüt pick up time: at 12:00h, return: at 20:00h. Rate unchanged. – Mooring fee and use of their services (Showers and wc). – Beach pack: beach umbrella, toy shovel and volley ball. – Snorkeling Pack: includes goggles, snorkel and fins. Compulsory insurance is included. The insurance deductible is €300. -Fuel: price Spock and Kirk 25€/day, Picard 35€/day. The llaüt is provided with a full tank of fuel, so you can set off as soon as you hop on board. This way you don”t have to waste time queuing and manoeuvring for refuelling. (charged in advance). The skipper is responsible to control the fuel’s level. RATES ARE FOR A BOAT RENTAL FOR ONE DAY (from 11:00 to 20:00 h) . -Skipper, price: €120 per day, from 12:00 t0 20:00 h.
-Fuel: price Scotty 20€/day, La Forge 25€/day.